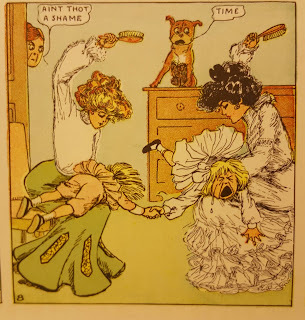 Facsimile edition of the 1904 hardcover collection Buster Brown And His Resolutions, which collects fifteen Sunday newspaper strips which were originally published in 1903 and 1904 in the New York Herald. 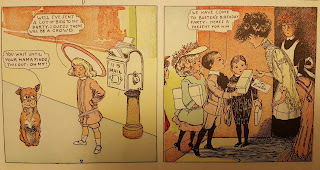 Before there were Buster Brown shoes there was Buster Brown the comic strip. R.F. Outcault was the premiere cartoonist of his day, arguably the first “superstar” in the world of comics. His Hogan's Alley (later The Yellow Kid) strip, published during the mid-1890s through the turn of the 20th century, made his name. His work on this strip and Pore Lil Mose remain criminally neglected in this golden age of comic reprints. I have been waiting for Sunday Press Books or another publisher to preserve them for posterity. The sad fact of the matter is that comic fandom as a whole has little interest in the history of the medium prior to superheroes, and reprints of strips like this would be expensive to produce and sell very few copies for any publisher brave enough to even try. If I ever win the Lotto I will procure a complete run of this series and start up a publishing company to rescue these lost classics from obscurity. 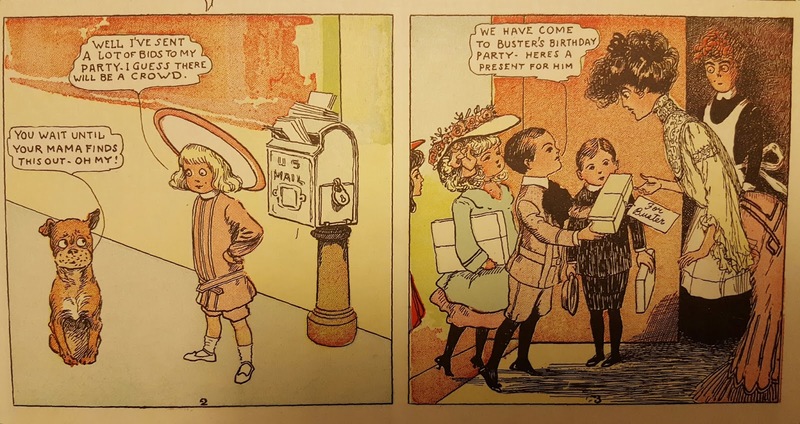 Early 20th century newspaper strips were compiled and reprinted in hardcover books. These were the first collected editions, if you will. I was looking at Buster Brown books one night on eBay when I came across this book. A few minutes on Google and I was able to peg this as an affordable reprint, and in color no less! Dover must have photographed the old book that they did this facsimile off of, as the colors are completely authentic and scanners as we now know them were science fiction back in 1974. The strip itself is charming. 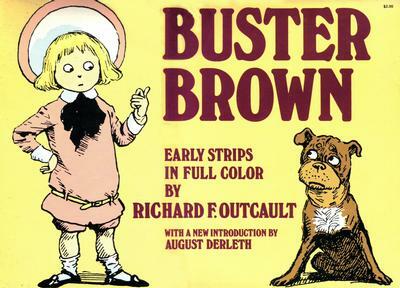 Buster Brown is a child in a well to do family during the then-contemporary Victorian era. The fashions and furnishings were current when published but look like something out of Henry Ford Museum today. Buster and his dog Tige always get in trouble, with Buster often finding his posterior region on the receiving end of a hairbrush. Buster tends to get himself into all manner of trouble with a resolution provided in a text panel in each strip. This book seems to span all seasons and doesn't seem to follow any publication order, as it skips back and forth between 1903 and 1904 copyright dates. The strips themselves are undated. 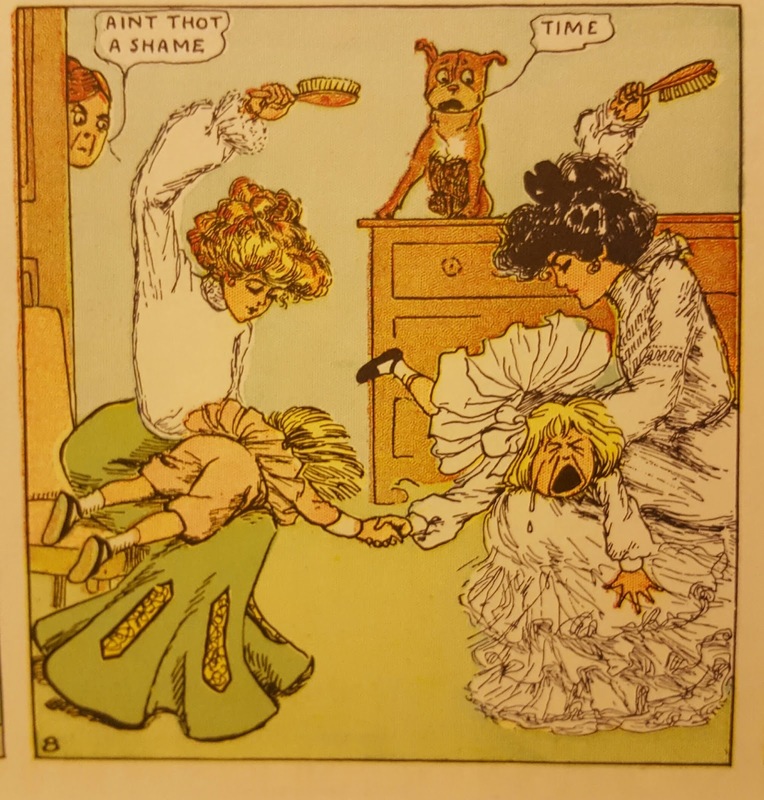 Beating your children with a hairbrush was not only acceptable, it was passed off as wholesome lowbrow family entertainment in 1903-1904. Outcault remains a genius. Many modern comic fans are willfully ignorant of the history of the medium. I am by no means an expert, but I am learning more all the time, and the Internet has made studying the history of the medium easier than it would have been in my younger days. Unfortunately many strips like this remain out of reach of most fans due to expense or scarcity. We have been living in the golden age of comic reprints over the past dozen or so years, and in spite of everything that has been published one thing remains clear: We have barely even scratched the surface. 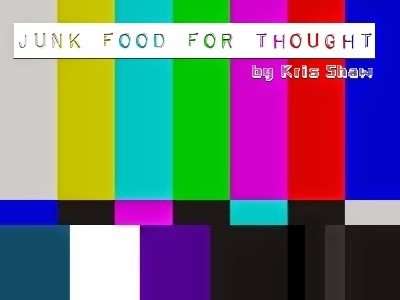 Junk Food For Thought rating: 5 out of 5. The OCD zone- This opens like a calendar, meaning that it opens vertically and not horizontally like a normal book. The strip was originally published as a full sheet. Those old newspapers were huge, so each one is cut in half, with one half on one page and the other half on the next. Linework and Color restoration: I have no source material to compare this to, but everything looks “authentic”. It's interesting how some of the earliest four color printing presses were more accurate than the ones which would turn up and print early comic books. Paper stock: Thick uncoated stock with minimal browning on the edges, a real feat for a forty-plus year old book. Binding: The binding is a stapled, saddle-stitched book. Cardstock cover notes: Extremely thick cardstock cover with a durable lamination. Join us in our quest for quality!